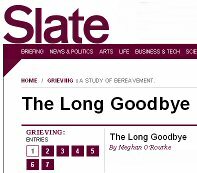 Meghan O’Rourke’s Slate series of reflections on the loss of her mother provides, in a complementary way, some other ways to look at death and grieving. Romm’s memoir was fresh in my mind when I read the seven parts to O’Rourke’s pieces from start to finish. After all, there must be other interpretations, other aspects to adjustment, to acceptance — both by the dying and by their survivors. But I was not persuaded (and O’Rourke is not after any mind-changing; the grief-striken are in a far different place) of the potential for anything short of the angry, wounding ricochets of loss Romm documented. and even join a book club on Goodreads. In the echo chamber of pain and tears Robin Romm inhabits in The Mercy Papers (Scribner, 2009), there are other characters: father Richard, boyfriend Don and a mother, Jackie, “who was the first to notice when the crocuses bloomed each spring,” even after she had been diagnosed with metastatic breast cancer. And other characters, too. But Ms. Romm’s shrieks are so piercing, so monstrously realistic that nearly all other voices are drowned out in this narrative. “You are home, Mom,” I say, holding her hand, which is hard as plastic from edema. “I know, ” she says, her face pleading, “but I want to go home.” My dad says I’m attaching meaning to this when it’s nonsense. At other times, The Mercy Papers’ rant achieves more. This is where Romm is at her best, craft giving lift to the despair where nothing else could. That lift — one is reluctant to use a more demonstrative expression — is very much in need. We could get a cup of coffee. But who wants coffee? Who wants to see anyone in the outside world? The outside world has gotten increasingly foreign. People smile for no reason, purchase sugary snacks, worry over leaky roofs out loud to strangers. Who needs this? No one in this house wants to talk about leaky roofs. We want to sit quietly and be known. We want to be soothed by quiet warm hands. We want to be passive, have the world come to us. If we are going to use our tiny reserve of energy to strike up conversation with a stranger, well, it might as well be with God. No one else is useful. Not that God is being very useful — up there punching buttons on his death remote, smirking away. Or, as Romm writes elsewhere, having nine years to prepare for the coming death still left her ill-prepared, and she works to convince the reader that this is as it should be.
. . . the changes won’t be hopeful — like the clarity of vision I sometimes feel when I’m in my bedroom after crying and the lines of the windows and slatted doors all look too sharp, hyper-sharp, and all people seem tragic and plain to me, easy to understand. Some of the changes will be only pain. Pain when I see babies, pain when my friends go to lunch with their mothers, pain on my birthday, on her birthday, on every birthday of every person I know. Pain and a deep, toothy hollowness inside me that will go on grinding forever. There’s some transference/substitution wound in the author’s psyche, as there’s far too much narration about pets. Even though the comings and goings, food ingestion and waste discharging of the beasts lends a certain authenticity to the story, this may appeal to only to inveterate animal lovers. On the other hand, had Ms. Romm not been an only child, descriptions of siblings might have been no less meaningless. When the reader arrives tearful and bloodied (and the blood will not all be your own) on page 194, Ms. Romm gifts the purchaser of this volume twelve Six Feet Under-esque blank journal pages (imagine the conversations with the publishing house over this decision). Loss doesn’t end. It goes on and on and on, written on every day that will follow. There you have it. Twelve blank pages for notes, after 194 pages of meticulous coaching. Preparatory notes, should it not yet be your time for such loss. Or, if your time has come, as it has for me and my mother (www.billieunderwood.com) only three months ago, then twelve blank pages just to gather up the bits of memory that loss has tried its best to obliterate. Ultimately, there is no making sense of it, but we are each judged — perhaps by someone much like Robin Romm — by the character of our wail. When the wailing ends, probably through mere fatigue, prepare to be instantly teleported back to that other place you live, the one where Barb would like her CD back.